Dear Mona, Which Is The Fastest Check-Out Lane At The Grocery Store? A man holds a shopping basket with groceries while waiting in line on May 9, 2014, at a Carrefour market shopping center in Paris. We’ve all been there. While grasping a stack of toilet paper and a carton of milk in the grocery store’s express lane, you glance to your right and see that other customers with cart-loads of produce are seamlessly drifting forward in their appealingly shorter lines. You start to contemplate whether you should stay put, switch lanes or just head home empty-handed to face dry cereal and your wet bum. There are several types of lines we could consider — textbooks classify queues according to how many servers there are, whether a customer is only served once (like at the dentist) or in multiple phases (like at a drive-through), as well as whether she gets to choose which line she joins. Since you’re interested in your grocery store, where there are almost certainly several servers and one phase of service, I’m going to focus on that last distinction: Are single lines better than multiple lines? 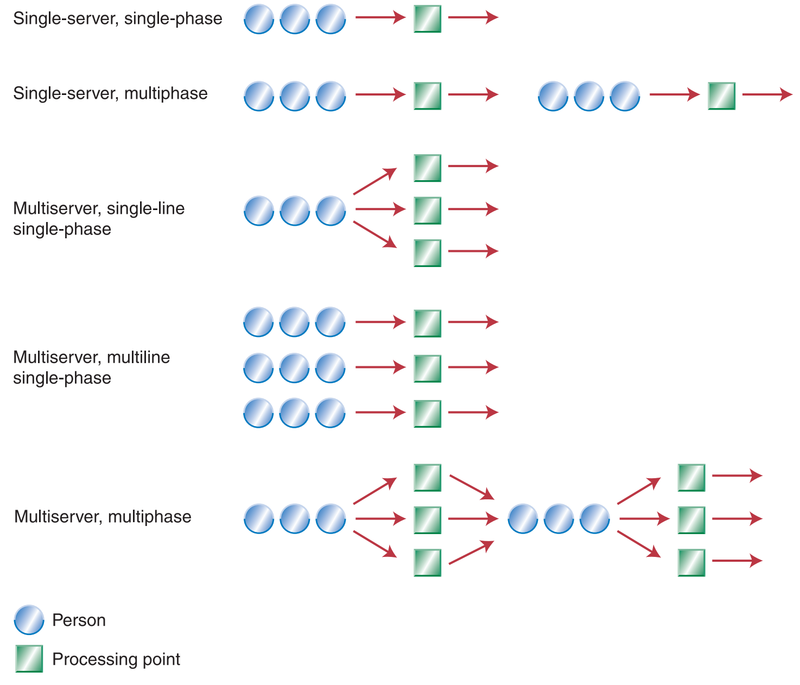 Queuing Typology from Supplement C, Waiting Line Models. But to make that comparison, I’d need to know things like the number of cashiers at your grocery store, the number of items customers have in their carts and the amount of time it takes to serve each of them. There isn’t any national data we can plug in to the formula to give us answers — the numbers vary considerably by store and even within a store, and will change on a weekly, daily and hourly basis. One alternative, then, is to run a simulation — pretend that 10,000 hypothetical people are waiting in your hypothetical store and see how their wait times vary. That’s what Wes Stevenson, a professional data analyst, did out of sheer curiosity. To test the difference between single and multiple lines, Stevenson quantified a few assumptions (10 cashiers, an average wait time of 3 minutes) and put them into his model to see what it would spit out. He found that the wait time in single lines is more predictable (you can see that in the chart below, where there’s a narrower spread of outcomes). 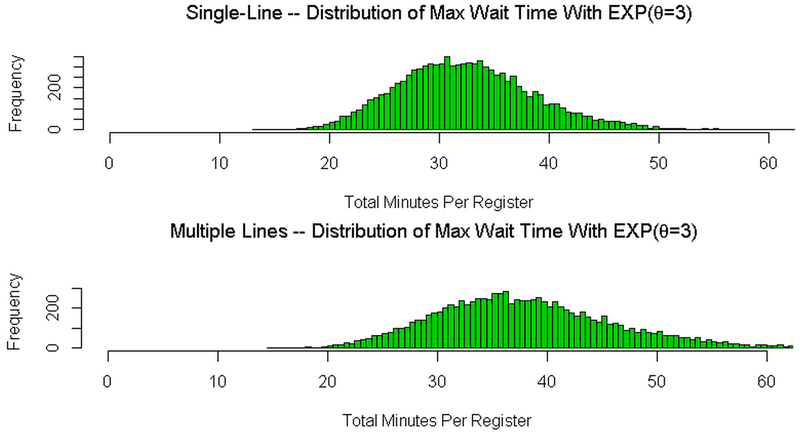 More importantly, though, Stevenson found that a single line is more likely to mean a shorter wait (also visible below, where the single-line chart clusters farther left than the multiple-line one, meaning that more of those 10,000 simulations produced a shorter wait time). In that respect, Stevenson’s finding concurred with well established queueing theory: One line is better than many. Queueing analysis by Wes Stevenson of statistical-research.com. One reason is that models like these overestimate the difference between single and multiple lines because they don’t take into account some human behaviors. Maybe you know your grocery store pretty well, Barry. Maybe you know who the fastest cashier is and which register has the drawers that always get stuck; maybe you can even spot that customer that always spends an age rummaging around for his wallet — and you pick your lane accordingly. Aside from careful queue selection, you might also switch lanes (known as “jockeying” in the queueing theory textbooks) or simply ditch your items and leave (“reneging”). Those behaviors, from you and other customers, reduce the average wait time in a multiple-line queueing system and bring it a little closer to a single-line system. To be fair though, if the models underestimate human intelligence, they also fail to factor in just how mistaken we can be. Unsurprisingly, longer perceived wait times means lower satisfaction. Or, to be more formulaic, perceptions feed into a simple equation written by David H. Maister from the Harvard Business School: S = P – E, where S = satisfaction, P = perceptions and E = expectations. One way then, Barry, to feel more satisfied with your grocery store experience (and your job, and your love life and just about anything) is to simply lower your expectations. I guess that probably doesn’t sound too appealing. It’s not just perceived waiting times that show how we as customers don’t have perfect judgment. Imagine your reaction if your local grocery store did switch to a single line. You walk in after a long day at work, and rather than seeing 10 neat lanes with four or five customers in each, you’re now met with a winding line of dozens of bodies. It’s probably harder to gauge the rate at which the queue is moving ahead than its simple length. Maybe you’ll turn straight back the way you came. That U-turn is known as “balking” in queueing theory and, from a business perspective, it’s a store’s worst nightmare. So, rather than simply shoving us all into one line, supermarkets are exploring a range of alternatives to reduce both our actual and perceived wait times. I spoke to Perry Kuklin, director of marketing at the queue-management consultancy Lavi Industries Inc., about the sorts of methods the firm suggests to its clients, who range from pharmacies to personnel services at U.S. army and naval bases. Kuklin outlined three main strategies that Lavi’s clients are using to improve the queuing experience. First, customers waiting in line can have their items scanned by roaming tellers with hand-held machines, to reduce their service time once they finally reach the cashier. Second, customers can register their place in line, go away, and come back once it’s their turn. There’s nothing new about this latter strategy, really, it’s just that rather than grabbing a paper ticket from the deli counter and waiting for your number to be called, you might receive a text message saying you’re up next. But it’s a third strategy that has really stood the test of time: distraction. “You can try to entertain customers with videos,” Kuklin said, “and in-line merchandising helps to keep them busy and distracted.” There are more cunning ways, too. After airline passengers wouldn’t stop complaining about the time they spent at baggage claim (even when more staff were added and wait times fell) a Houston airport simply moved the arrival gates so that passengers spent more of their “wait” time walking to the baggage claim. The complaints all but disappeared. All of this shows that we who stand there desperate, tired and irritated are not perfect. But we’re also not perfectly imperfect. So, until your grocery store switches to a single-line system, my advice to you is: Be observant, and (if you don’t want to examine chewing gum and candy bars for a distraction while you’re waiting in line) take a book.